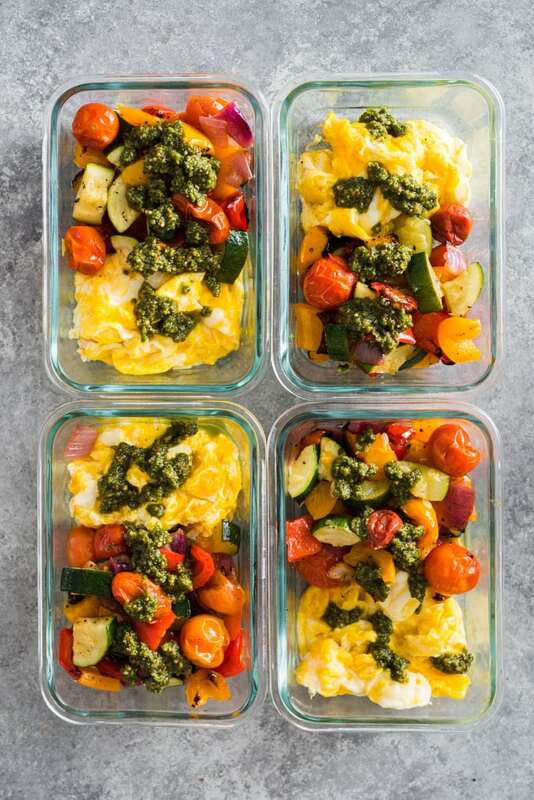 These veggie scramble meal prep bowls are here to make your breakfast routine a little easier, a lot faster, and super tasty! These guys are packed with scrambled eggs and colorful roasted vegetables, then drizzled with protein-packed dairy free pesto. Whether you’re paleo, Whole30, gluten free, low carb, or just want a delicious, warm breakfast to start your day, this prep bowl is for you! Who’s got two thumbs and a healthy breakfast all week? 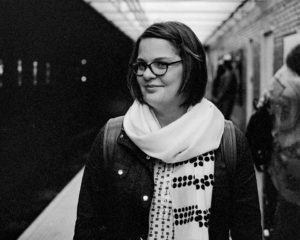 This lady right here. And not because I get up early every morning to make myself a carefully balanced and exquisitely crafted warm and nourishing meal. Hahahahahahahah. That’s a hot bucket o’ nope right there. It’s because I’m a big, big fan of meal prepping for breakfast. As much as I love cooking, I am the textbook definition of “not a morning person”, so the early morning hours are not the time for me to get the job done. If I don’t set aside an hour over the weekend to either partially or fully prep a breakfast plan for the week, I typically power through the morning high on coffee and cheese. Delicious? Um, yeah. Nutritious? I’ll let you decide. 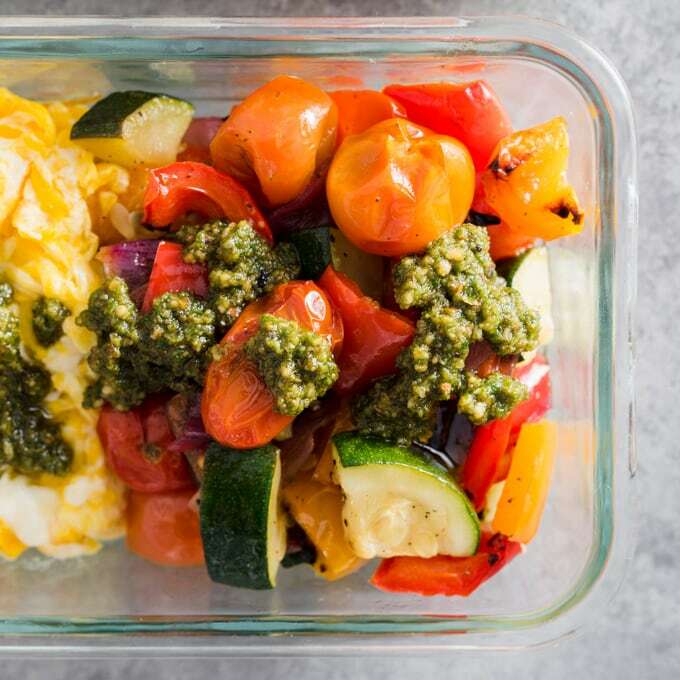 This veggie scramble with dairy free pesto is one of my favorite meal prep bowls. It’s packed with protein, incredibly nutrient dense, and couldn’t be easier to make. Pin it now! Click here to save this Veggie Scramble to your Meal Prep Recipes Board on Pinterest! Let’s take all of the work out a typical veggie scramble but keep all the flavor m’kay? Yes! PS – I use these glass pyrex snapware containers for all of my meal prep and leftovers. They’re incredibly durable (I have kids, they need to be! ), the lids fit snugly, and they don’t get too hot when you microwave them. Fully endorse. Dice the veggies into a uniform size, then toss with olive oil, salt, and a pepper in a mixing bowl so they’re uniformly coated with fat and seasoning. Spread the vegetables onto a baking sheet lined with parchment paper to prevent them from sticking to the pan. Leave a little space in-between so they can can properly caramelize. Group the vegetables based on cooking time, and spread them between two sheet pans. 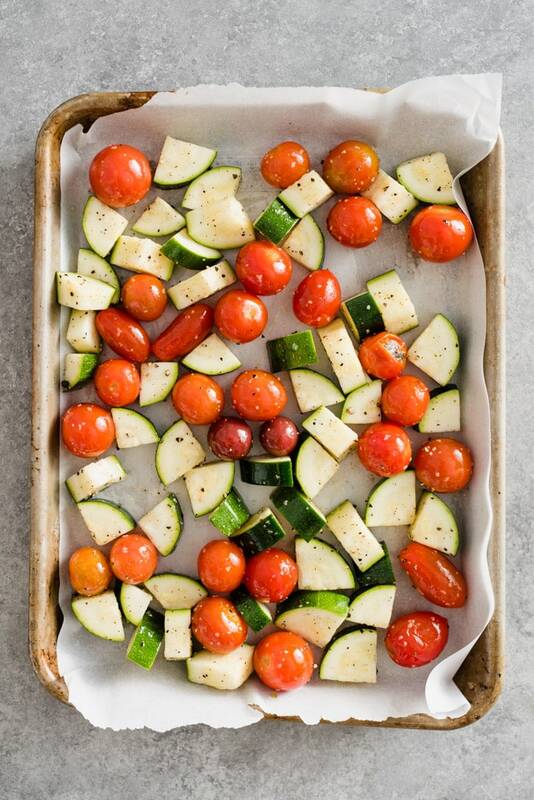 For this recipe, I spread the onions and peppers onto one baking sheet (they need about 25 minutes to roast) and the zucchini and tomatoes onto another (they need about 12 minutes to roast). Undercook by a few minutes! Roast the vegetables until they’re just barely crisp tender. You’re going to be reheating them for about a minute in the microwave, so if you cook them fully now, they’ll be on the soggier side when you reheat them. Lastly, give them another layer of depth and flavor by seasoning with a squeeze of fresh lemon juice after they come out of the oven. Sauce is boss in my world, and this veggie scramble is no exception. 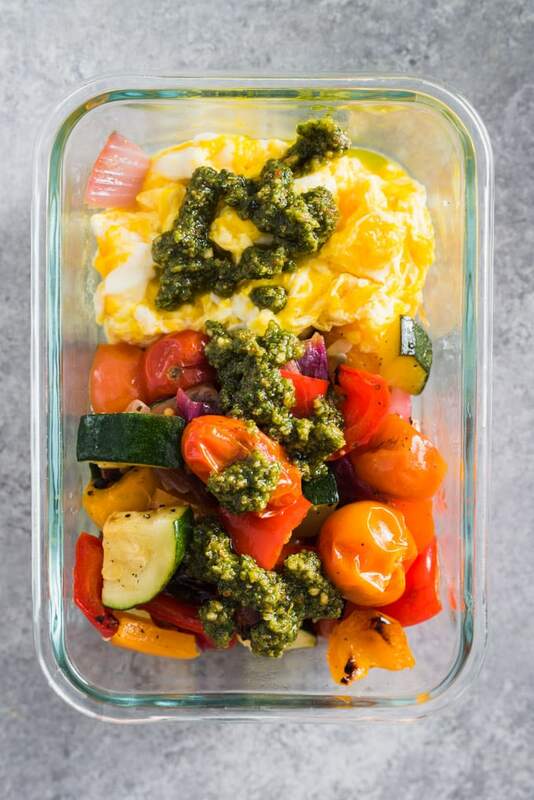 I finish off these egg and veggie meal prep bowls with a drizzle of dairy free pesto. 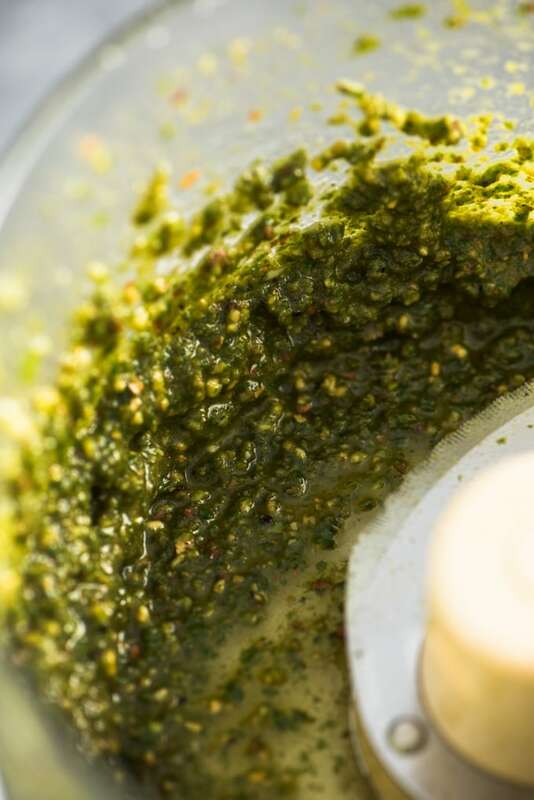 I made this pesto with almonds for an extra kick of protein and healthy fats. 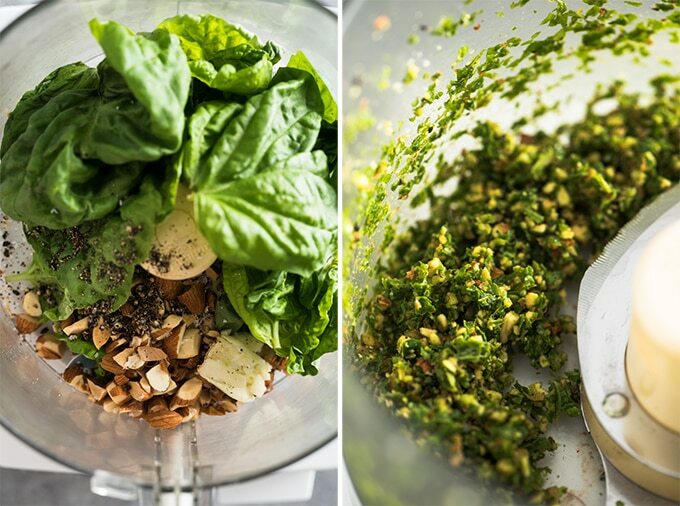 To make the pesto, put some almonds, fresh basil, a clove of garlic, and some salt and pepper into a food processor. Pulse until the herbs and nuts are pulverized, then pour in some extra virgin olive oil through the feed tube while the motor is running until the pesto comes together. If you like this veggie scramble meal prep bowl, you’ll probably also love my recipe for Ground Turkey Hash with Squash and Peppers. It’s perfect for meal prep, and both paleo and Whole30 compliant! 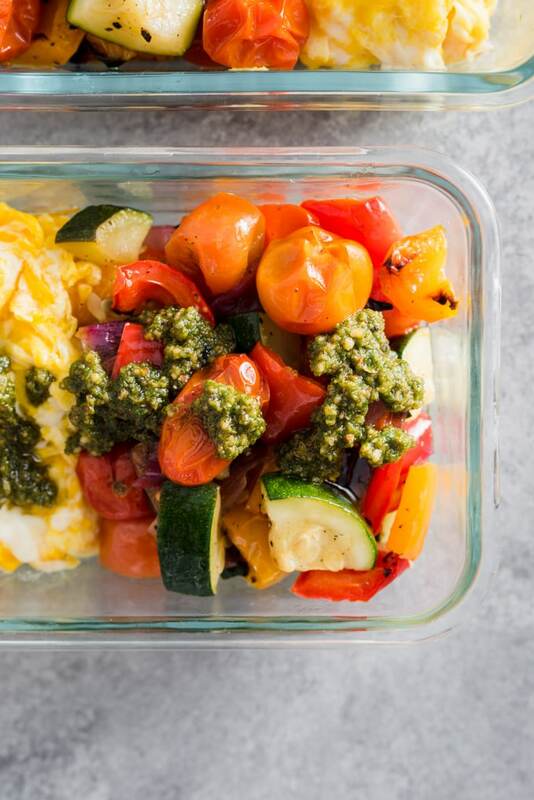 DID YOU MAKE THIS VEGGIE SCRAMBLE MEAL PREP BOWL? I WANT TO SEE YOUR CREATIONS! SNAP A PICTURE AND SHARE IT HERE ON PINTEREST. 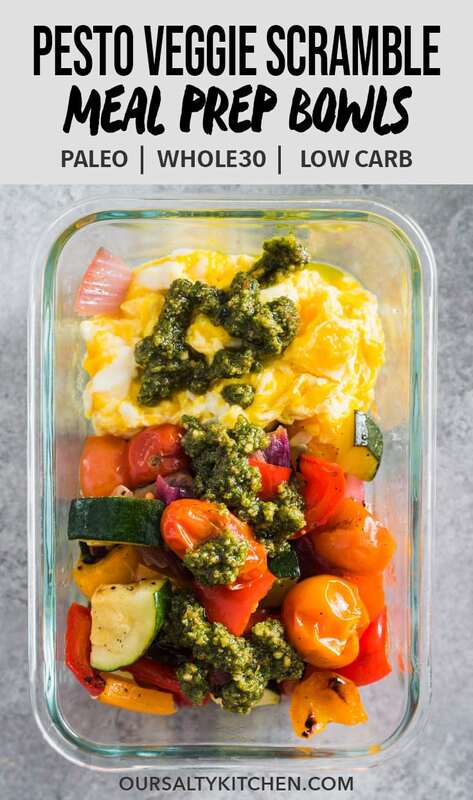 This paleo and Whole30 veggie scramble is a delicious breakfast meal prep recipe that's packed with tons of protein and super easy to prepare. Heat the oven to 425*. Line two baking sheets with parchment paper and set aside. 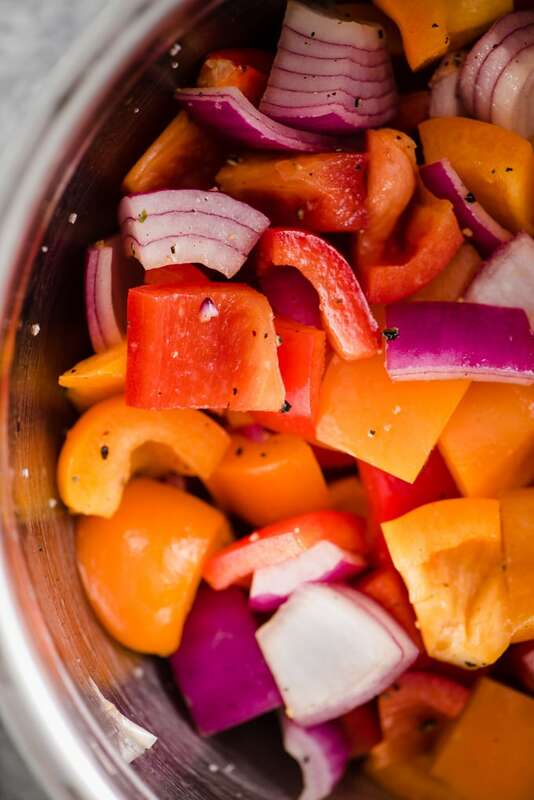 Toss the diced onion and bell pepper with half the olive oil, ½ tsp salt, and ½ tsp cracked black pepper. Spread onto one of the parchment lined baking sheets, transfer to the oven, and set a time for 10 minutes. Toss the cherry tomatoes and zucchini with the remaining olive oil, salt, and pepper. Spread onto the second parchment lined baking sheet. 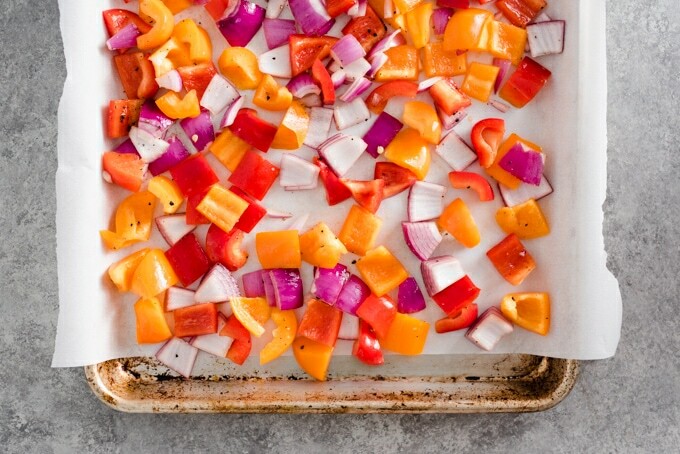 Once the time goes off, remove the baking sheet with the onions and peppers from the oven and stir the veggies. 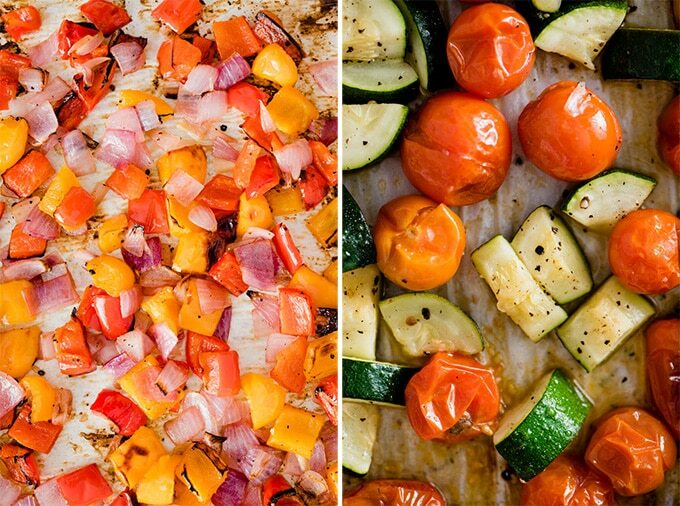 Return both baking sheets to the oven and roast all of the vegetables an additional 10-15 minutes. Remove from the oven once the onions and peppers are barely bit tender, the cherry tomatoes are just starting to burst, and the zucchini soft. While the veggies are roasting, make the scrambled eggs. Crack the eggs into a large bowl and scramble lightly with the salt. Heat a 10" non-stick skillet over medium high heat. Add the ghee and heat until it melts. Add the eggs and gently scramble until cooked through. Make the pesto. Place all ingredients except olive oil into a food processor. Pulse until the herbs and nuts are pulverized. Flip the motor to continuous, and pour the olive oil through feed tube until the pesto comes together. Divide the eggs between four containers. Add of quarter of the roasted vegetables to each container. 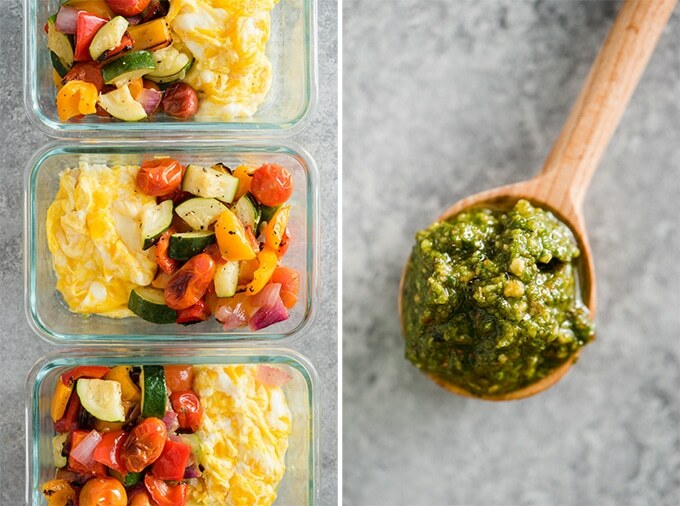 Drizzle the eggs and vegetables with a quarter of the basil pesto. Seal the containers and place in the fridge. To reheat, loosen the lid and microwave for thirty seconds. Stir the veggies, then microwave an additional 30 seconds. These veggie scramble bowls keep in the fridge for up to four days.